The north point of Kamaʻole III Beach Park was once known as Kalaehuku, and this name included the sand beach as well. The rocky south half of the park's shoreline was called Anaʻiao, for an inlet where large schools of ʻiao, a popular bait fish, congregated. The beach at Kama’ole I11 is a short but wide pocket of white sand bordered by rocky points. Large rocks are also exposed in several places along the beach at the water's edge. The sandy offshore bottom slopes quickly to overhead depths-a danger to little or nonswimming children. The waves in the shorebreak attract bodysurfers. The ocean is safe for swimming except during heavy surf or kana storms. During these times strong rip currents and a powerful shorebreak make swimming very dangerous. 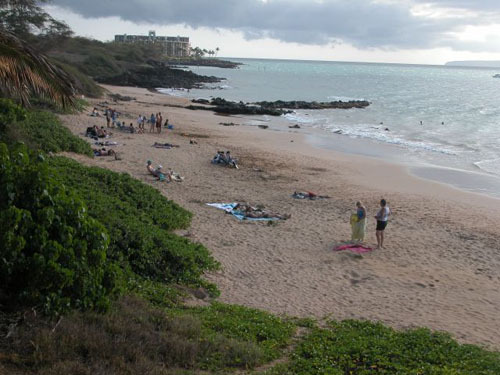 Although Kamaʻole III has the smallest beach of the three Kama’ole parks, it seems to be the most popular. This popularity is probably due to certain specific features of the park itself: it is the longest and the widest of the three, it is the only one that has playground apparatus for children and it has the most parking. Other facilities include restroom, showers, picnic tables, and barbecue grills. The south half of the park is underdeveloped and covered with kiawe.